Note that the resort is planning an expansion that will boost its water park to 70,000 square feet. The WaTiki boasts tropical themeing and features a bowl ride, a lazy river, some decent body and tube slides, and a whirlpool spa. Like most water parks, it also offers an interactive play center with small slides and a tipping bucket. The planned expansion would add an Aqualoop, which will release passengers in launch chambers into a 50-foot drop and then send them soaring through a near-vertical inclined loop. Other additions include The Whizzard, a dual-lane mat racing slide, and Banzai, speed slides that use launch chambers with trap doors. The resort includes over 250 guest rooms and suites spread between two adjoining hotels: the LaQuinta Inn and Fairfield Inn. In addition to the indoor water park, the resort offers a video arcade and a bar and grille. 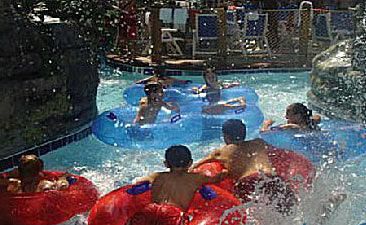 While WaTiki was the first indoor water park resort in the area, a second one, Rippin' Rapids Resort is offering competition. Currently 30,000. Planned expansion would boost it to 70,000. Open to registered hotel guests. Day passes are available for the gerneral public as well. Exit 61 off I90. The water park is at 1314 North Elk Vale Road. Bowl ride, lazy river, tube slides, body slides, interactive play structure with dump bucket, chidlren's activity pool, whirlpool spa.